Summary of today’s show: Every year, CatholicTV becomes ChristmasTV for three days starting Christmas Eve. Bonnie Rodgers and Helen Lee from CatholicTV join Scot Landry and Fr. Matt Williams to talk about all the great programming on tap for the holiday as well as the new shows on tap for the new year, including The Gist, a new talk show for women. They also discuss CatholicTV’s ubiquitous presence in new media and how they’re using every possible medium to spread the message. Plus all their favorite CatholicTV shows. What’s your favorite? 1st segment: Scot explained why The Good Catholic Life did not air live on 1060AM yesterday because of difficulties at the network in Buffalo, but listeners can listen to it online on our site and it will air again next Tuesday, December 27. Fr. Matt said he loves the Christmas season, including driving around and seeing all the lights decorating homes. He will celebrating Masses at St. Joseph in Holbrook, where he lives. For his family, their celebration will center around liturgies. His family gets together on the day after Christmas for a memorial Mass for all the deceased members of his family. His grandmother died many years ago on December 26 and it’s become a tradition ever since. Scot mentioned that tonight is the night for The Light Is On For You, when every church and chapel in the archdiocese will be open 6:30-8pm for confessions. If you’re looking for a parish, go to PilotParishFinder.com. Fr. Matt talked about why we need to go to confession especially before Christmas as we prepare to welcome Christ. 2nd segment: Scot welcomed Bonnie Rodgers and Helen Lee. He asked Bonnie what brought her to CatholicTV. She’s been there for 4 years. She met General Manager Jay Fadden in the Masters of Arts in Ministry program at St. John Seminary. She was working for Verizon at the time, then got early retirement from her job. Jay hired her first as part-time in marketing and now she’s been there four years full-time overseeing public relations, marketing and programming. She said those three aspects really connect together. Helen started at CatholicTV about 4 months ago. She oversees all social media: Facebook, Twitter, and YouTube, and manages video-on-demand resources. Scot said CatholicTV is trying to reach people in their 20s like her. Helen majored in college in new media communications and theology, so she was looking to do something like this when she graduated. Twenty-somethings are in those media and that’s where they are. She’s in the Facebook newsfeeds of many of her Catholic friends from Fordham University now. Scot asked Bonnie all the ways people can get CatholicTV, in addition to cable TV. Bonnie said they want to be wherever people are consuming media. They want to be on every platform, but they want to design for the particular platform. They’re on Twitter, articulating the faith in 140 characters or less. There is YouTube, where they tailor their work for the format. They include both soundbites and segments as well as full programs. They’re on Facebook as well. They are now available throughout the country on cable and Sky Angel IPTV. Scot said you can watch the content at CatholicTV.com. And a small widget can be placed on any website or blog so people can watch the programming on other websites. Bonnie said a diocese in Ohio was using content from CatholicTV for faith formation via DVDs on cable access television. But they adapted it for CatholicTVjr and the whole diocese started using it. They introduced it to the bishops at the US bishops meeting and they’re having dioceses ask them to tailor it to their purposes. Scot asked how many people watch the programs on other platforms other than TV. Bonnie said it’s hard to quantify how many are there, but she loves the stories. She encountered a man in New Jersey once who stopped her and knew her from the daily Mass. He’d watched every day from Afghanistan on his iPod and remembered seeing her do the readings. They are now in a little more than 11 million homes via cable. They do see a big spike in viewership on Sunday for the Mass from the University of Notre Dame and the Mass from the National Shrine of the Immaculate Conception. Scot said “Going My Way” is a funny program that interviews priests and makes them sing songs and do other bits. Bonnie said the premise is to show priests are normal people and having a good time. When she first started at CatholicTV, she thought the show was pretty hokey, but they get so many calls for the show that love it. One man called who had been in RCIA and was getting discouraged at the “Church of No”, but he saw the priests on Going My Way and how much fun they were having and he decided he wanted to be part of a church like that. It’s a sing-a-long show with priests from anywhere in the world they can get them. Fr. Matt said he was on the show in 2008, just before July 4 and just before World Youth Day Sydney. He remembers saying he didn’t know what to sing, because he’s not much of a singer. He sang patriotic songs and so now it airs every year before July 4. Scot asked if Going My Way is the most popular show. Bonnie said absolutely. The show has a great following from young to old. She said Stephen Colbert’s Comedy Central show “The Colbert Report” once featured it and called Fr. Chris Hickey, the host, the modern Merv Griffin. Bonnie said there are just about 30 people now working at CatholicTV, so everybody pitches in to carry off all the programming. Scot said he notices that people spend their whole careers at CatholicTV, there’s a lot of loyalty among the employees. Bonnie said there’s a great ability to attract people, especially those in technical fields. Part of the attraction is that with such a small crew, people can try their hand at many disciplines. 3rd segment: Scot said Christmas is a big deal at CatholicTV because of all the special programming. Bonnie said they turn into ChristmasTV starting with Christmas with midnight Mass from the Vatican. Many of the shows do special Christmas editions. Fr. Reed and Jay also do special reflections. There are also many programs of music including choirs from the Vatican. They have some movies and cartoons about St. Nicholas. It goes for three days. Scot said people love to watch the homily of the Holy Father on TV. Bonnie said the midnight Mass is so beautiful, as well as Masses from the Basilica of the Saxcred Heart at Notre Dame, and the National Shrine. Scot said there are 61,000 fans of CatholicTV on Facebook. Helen said online they plan to post many different video reflections and soundbites on YouTube and Facebook. They also had a musical group last week. Fr. Matt asked how many follow them on Twitter. She said about 12,000. He said he’s amazed how many young people are moving from Facebook to Twitter. Helen said the Twitter users are very active, retweeting their content. He asked how to use Facebook and Twitter to evangelize. Helen said she’s lucky at CatholicTV to have the daily Mass to pull from the homilies and other good messages from shows. She also uses her theology background to create messages to reconnect people to the faith as they go through their day. She said when there are big events that CatholicTV covers during the work day, she tries to tweet excerpts for those who are at work and can’t watch. Helen noted that many of the followers on Facebook and Twitter aren’t even from this country and communicate in other messages. Scot said that Facebook and Twitter users skew young, but aren’t only young. Helen said there are many followers on Facebook who are 35-50 who are vocal and a lot of younger followers who are pretty quiet. Bonnie said at the National Catholic Youth Congress they had over 700 kids like them on Facebook and told them that while they don’t post much there, they do read it. 4th segment: Scot said it seems like CatholicTV is always launching new programs. He asked about the new program launching in January called The Gist. Bonnie said the hosts are Danielle Bean, editor of Catholic Digest, Rachell Balducci, author of How Do You Tuck in A Superhero, and Carolee McGrath from Springfield. They will talk about anything and everything of their faith. They’ve recorded their first six episodes already. They drive home that our faith is a lived one. Scot asked if it’s a Catholic version of the View. Bonnie said it’s like that where talk about current events, issues of life, and anything else through a Catholic lens. They talk about managing their families and raising kids, for example. It launches January 3. It will have five or six air times. One of the toughest things about coming up with a new show is the new show title. They were excited that Helen was able to grab the name on Facebook and other social media. Danielle and Rachel are very into social media while Carolee is just into media. Scot said Rachel was on one of our early shows and it was a very funny episode. Her blog is Testosterhome chronicling raising her six boys and one daughter. Helen said user-generated content will be important for the Gist. They started weeks ago on Facebook and Twitter with polls and questions to get real-world feedback from women to feed the discussion on the show. Scot said on Thanksgiving they launched “Mass Confusion”, the first Catholic sitcom. Bonnie said there’s been a lot of great feedback. It was created by Greg and Jennifer Willits from Georgia. She noted that Georgia has the fastest growing Catholic population. She said they’ve created other great content that CatholicTV has used in the past. Scot said the Willitses co-host a daily radio show on SiriusXM’s The Catholic Channel. It was big departure for them to do completely scripted TV. It’s also a very expensive show to produce because of the number of people involved. But the appreciation and response was so great that they are looking at how to make it work if they can. Fr. Matt asked about the premise of the show. It features two Catholic families, the other played by Mac and Katherine Barron, and the first show is about a birthday party for Jennifer and some confusion over a pregnancy. Scot said it’s about real life and family. He said he saw it at the Catholic New Media Celebration in October and the crowd of 200 people laughed boisterously. He said it’s family friendly. There’s nothing you’d be unhappy about your kids watching, even though the quality is as good or better than what you see on network TV. Scot said entertainment is part of CatholicTV’s mission. We’re Catholics that love to laugh, to express joy, to take our faith seriously, but not to take ourselves seriously. Bonnie spoke of another show called House+Home where Fr. Reed goes into a home to meet a family and they take over the house for the day. With Mass Confusion, they took over the Willitses house for several days. Helen said people can watch it on YouTube, on Verizon on Demand, or on the CatholicTV website. 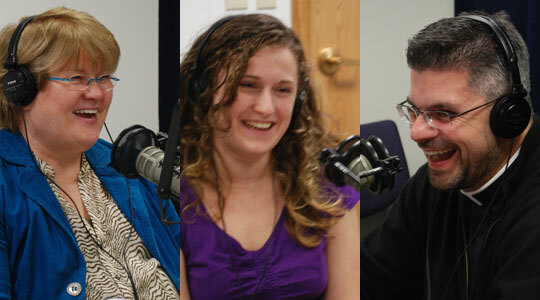 5th segment: Scot asked about programming that comes from other Catholic dioceses. While they are part of the Archdiocese of Boston, they are also America’s Catholic TV Network. Diocese of Trenton produces a youth program called Real Faith TV, which has won Emmy Awards and Gabriel Awards. Diocese of Springfield, Diocese of Rockville Centre, and Diocese of Brooklyn produce shows too. Diocese of Worcester does a show with Bishop McManus. Scot asked Helen about her favorite program. She said she likes Mysteries of the Church and Seventh Street Theater. It’s not a Catholic TV show, but it’s a theater troupe that put on faith-inspired shows. Scot said one of his favorites is Catholic Destinations with Kevin Nelson. They have gone to many cathedrals and shrines around the country and in some other nations. He’s also enjoyed House+Home, including seeing how families integrate the faith into their lives. Bonnie said Mysteries of the Church is from the Diocese of Brooklyn and it’s as good as any Discovery Channel show. Scot asked about Way of Beauty. It was shot on Thomas More College and it has high-production values. It looks at how art expresses our faith. Helen said ClearVoice is a Catholic magazine show that helps people be informed about what’s going on in the Church all around the world. Scot said Wow: The CatholicTV Challenge is now going into its 10th or 11th season. It’s a game show for kids which quizzes them on their faith. Bonnie said people call from all over about how great it is. Catechists tell them that they use the show to teach their classes. Scot said his kids love the competition aspect, but it also leads to discussion about the faith. We’ve Got To Talk with Fr. Dan O’Connell has been on the air for over 20 years. Bonnie said he brings energy and love to that show. It’s the longest-running program, outside of the Mass. He gets into all kinds of situations with the show and brings the same energy. The Spotlight features Fr. Chip Hines and Fr. Bill Kelly doing movie reviews. Scot said it’s a wonderful program that takes movies seriously.